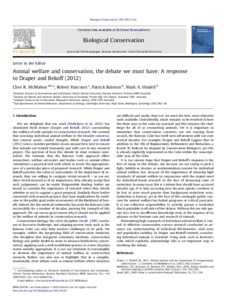 We are delighted that our work (McMahon et al., 2012) has stimulated fresh debate (Draper and Bekoff, 2012) surrounding the welfare of wild animals in conservation research. We contend that assessing individual animal welfare in the broader conservation context needs careful thought. While Draper and Bekoff (2012) raise a number pertinent issues around how best to ensure that animals are treated humanely and with care in any research project. The question of how this should be done remains unresolved. We reiterate that the Bateson Cube approach offers researchers, welfare advocates and bodies such as animal ethics committees, a practical tool with which to assess the appropriateness of a particular piece of proposed research. While Draper and Bekoff question the value of assessments of the importance of research, they are willing to castigate trivial research – as are we. Since trivial research is of no importance, they already accept that such judgements can be made. Responsible funding bodies are bound to consider the importance of research when they decide whether or not to support a grant proposal. Similarly those bodies concerned with research projects that have implications for medicine or the public good make assessments of the likelihood of benefit. Indeed, the bio-medical community has used the Bateson Cube successfully for a number of decades, proving the strength of this approach. We can see no good reason why it should not be applied to the welfare of animals in conservation research. Conservation biology, the crisis discipline (Soulé, 1985) continues to face new challenges and adopting proven tools such as the Bateson Cube can only help resolves challenges in its path. For example, within the burgeoning field of conservation medicine, (the discipline that integrates veterinary medicine, conservation biology and public health in order to advance biodiversity conservation) applying such a well established process to a new situation seems entirely appropriate. It is not our intention to oversimplify or demean the importance of animal welfare in conservation research. Rather, our aim was to highlight that in a complex, emotionally riven debate such as animal welfare where decisions are difficult and rarely clear-cut, we need the best, most objective tools available. Undoubtedly, much remains to be resolved in how the three axes in the cube are assessed and this remains the challenge for all of us researching animals. Yet it is important to remember that conservation scientists are not starting from scratch, the Bateson Cube has itself seen refinement with use over several decades. For example, Draper and Bekoff suggest that in addition to the 3Rs of Replacement, Refinement and Reduction, a fourth ‘R’, Refusal, be adopted by Conservation Biologists, yet this is already explicitly represented in the Cube within the ‘unacceptable’ area of the Cube. It is our sincere hope that Draper and Bekoff’s response is the first of many in this debate, not because we are trying to pick a fight, belittle or dismiss as sentimentalism concern for individual animal welfare, but, because of the importance of ensuring high standards of animal welfare in conjunction with the urgent need for individual-based research in the face of increasing rates of extinction. In many ways this is a debate that should have occurred decades ago. It is only occurring now because species continue to be lost at rates much greater than background extinction rates. Extinction is forever, yet in the face of this onslaught public concern for animal welfare has halted programs at critical junctures. It is our collective responsibility to actively pursue a resolution that is palatable to all sides of the debate. Without this we risk species loss due to insufficient knowledge even at the expense of no advance in the humane care and research of animals. Maintaining high standards of individual animal welfare is central to effective conservation science research conducted to advance our understanding of individual life-histories, vital rates and population viability. As Draper and Bekoff contend, considering individual animals is essential. Using tools such as Bateson’s cube which explicitly acknowledge this is an important step to resolving the debate.